The best things in life are free—and easy. Take this weed salad that uses purslane as the featured ingredient. It's delicious in inverse proportion to the time and skill required to make it. Which is to say it's really good and really simple. First, a word about weeds. You've heard me extol their virtues before. If you're still a non-believer that weeds can save the world, I insist you try this recipe. Most Americans are busy pulling purslane (Portulaca oleracea—same family as miner's lettuce) right now if they're thinking about it at all—and pulling their hair out, too, because like Himalayan blackberry purslane can never be vanquished. But it can be eaten. Here's what you do. 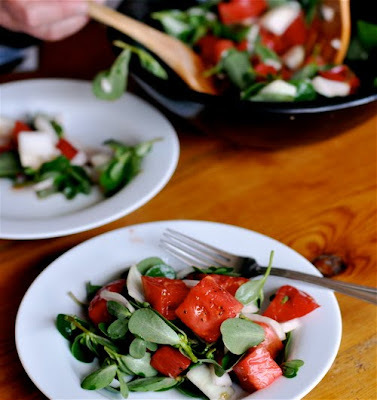 Pick a bunch of purslane, stem it (making sure to keep many of the leaf clusters intact), and toss it with a chopped sweet onion such as a Walla Walla and a large ripe heirloom tomato. That's it. Season with salt and pepper and allow the tomato juice to form the dressing; squeeze a chunk of tomato into the salad if necessary to get the juices flowing. You'll be amazed by the results. 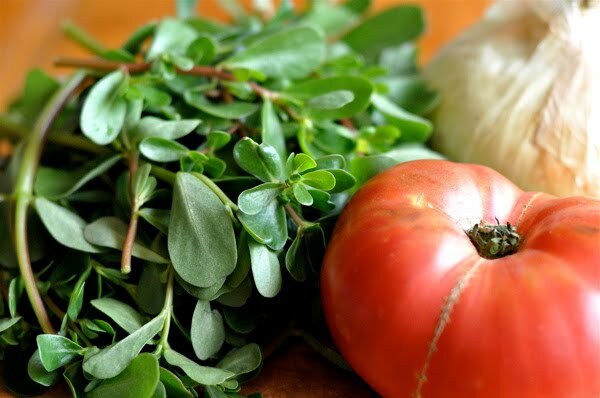 Purslane has a crunchy texture and a complex flavor that marries perfectly with the acidic tomato juice and sweetness of the onion. Jon Rowley turned me onto this salad last summer at an oyster fest and we ate it again the other day when I dropped by his house to pilfer a few of the shoots for my own garden. That's right, I'm planting weeds! I plant weeds too :). My neighbours hate it-- I have a garden full of dandelions, lambs quarters, nettles, yarrow, and mallow. Purslane is my favourite though, I just love the flavour of it. I saw a big bunch growing in a flower bed about a week ago, but I didn't know whether the flower bed owner used weird chemicals or not... do you just pick yours from anywhere, or are you careful about pesticides and road fumes and stuff like that? I grow it in my garden, but honestly can't say I've seen it here native. Maybe I'm not looking hard enough, but it's certainly not the weed that lamb's quarter is, for ex. 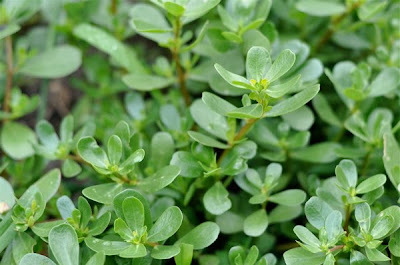 Whatever the case, it's really nice, and I've made a lot of purslane fans simply by introducing it in salads to guests. Very underrated green, no question. 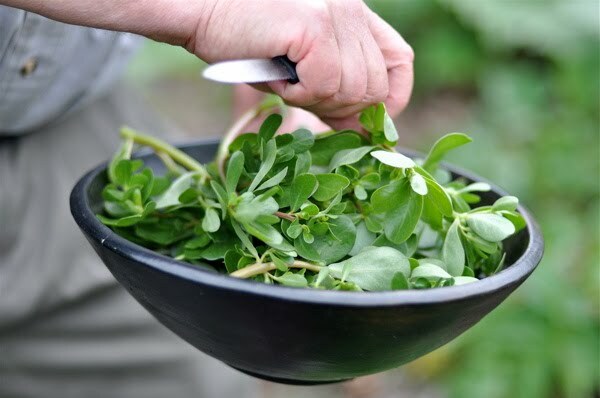 never heard of purslane, then again we are not famous for our salads, I love to experiment and this I would definetly enjoy.. I've always wanted to try this and now that I've come back from vacation to a weed-infested garden, I have more than enough of that ingredient. Purslane - It's what's for dinner. Rebecca - Good for you! We're driving down the real estate values of our respective 'hoods as we eat. I finally mowed the front lawn the other day--there was a collective sigh of relief up and down the block. Re: chemicals: I'm careful about where I pick. Luckily the stigma of using nasty lawn chemicals seems to be taking root in my area. Kevin - It's a good "starter weed" for sure to hook in the unsuspecting. Jelena - You might ask around. Purslane is pretty wide-spread. I think it originated in Eurasia--it's been used in India and Mediterranean countries for centuries. Good luck. Ciao Chow Linda - I'm confident you'll love it. Wish I had some of your juicy Jersey tomatoes to go with. love purslane! Too bad I didn't know about it as an edible plant when I was pulling it out of my huge minnesota garden years ago. live and learn! i just saw a neighbor with barrels of this growing on their stoop, and i wondered why they needed so much of a rather undistinguished-looking plant. now, i may have to steal some. I believe I have purslane trying to crowd out my new asparagus bed I planted this year (I have been bad about weeding). What I am wondering is if purslane can get so large that it is no longer tasty. I have some very large stems on my weeds. I am a big fan of purslane - I've grown the fat-leaved German variety as a garden plant many a time. It is one of the best hot-weather greens out there, too. I sampled purslane at a farmers market in NorCal last year -- purslane tossed with a tomatillo/green sauce and tucked into a cheesy quesadilla. I've been wanting to add it to our garden, and your beautiful pictures are all the more motivation. We'll have to try your simple salad with tomatoes -- sounds deluxe. looks so healthy and delicious!! I just came over from girlichef to find out what purslane is. It IS the weed I have growing in my garden. I wonder if I can get my husband to eat it? Maybe if I show him your post?